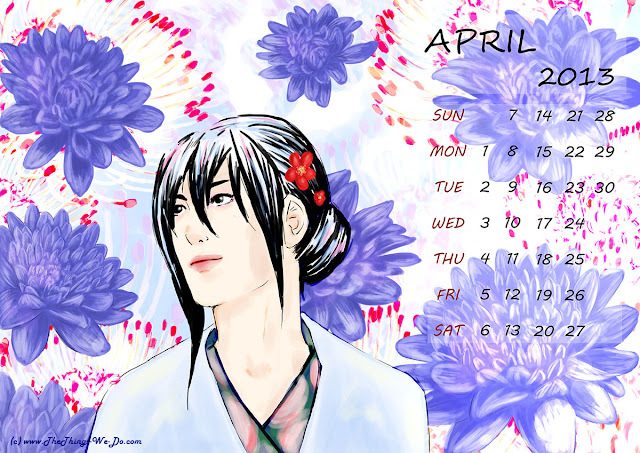 Here is the new printable calendar for the second month of sping – April. Spring is the time to reach to the sun, grow yourself and prepare to blossom! Doing so requires inner fimness and calmness. Japanese used to gain this state by observing the flowers grow. So you can download this month’s printable calndar or use it as a desktop wallpaper. The darkhaired girl in the light grey kimono will inspire you and the delicate violet crown daisies ( chrysanthemums) will bring peace and tranquility to your mind. Simply click on the illustration below to view the image full size. And after the April is past by, you can cut off the part of the picture with dates and use it as an inspirational illustration at your work place. p.s. To view the other months’ calendars go to the Calendar page here.